Waterline Controls stands apart from Honeywell Sensors and Controls in several key areas. Honeywell makes temperature sensors. 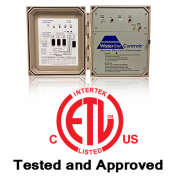 Waterline makes one control panel that has a temperature sensor to operate a cooling tower basin heater (WLC-6100T). Read more to compare our key points and see what makes us unique. Never replace a level controller again!